Moving back through the history of pies…we come to the “Test Kitchen Classic” – a pumpkin pie recipe from Cook’s Illustrated. It’s more scientific and thought-out than granny’s pie recipe, but less “Pie Version 2.0” than the concoctions in my Baked cookbook. I should probably note as well that the crust for this recipe (and for the two which will follow shortly) was also from Cook’s Illustrated. Pie is a very curious food: it appears simple, and is often made with few ingredients, yet tiny tweaks to crust and filling can take a simply “good” pie to a whole new Blue Ribbon level. 1. 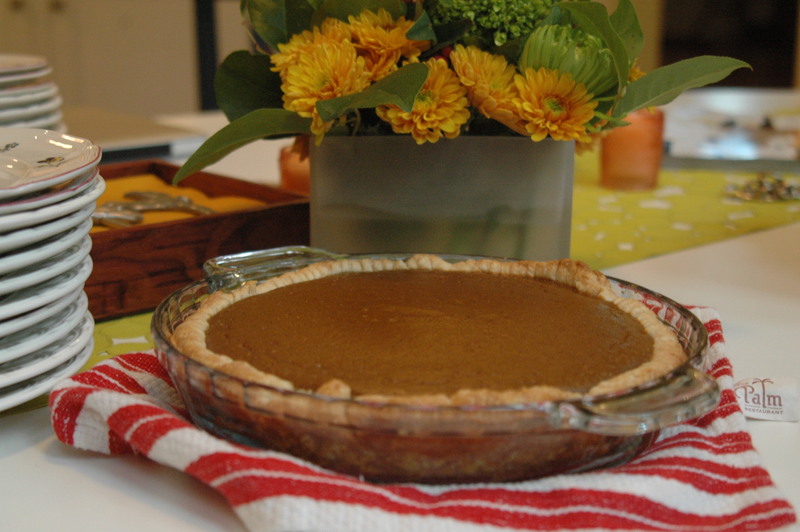 Place a rolled-out crust in a pie pan and refrigerate for 20 minutes (or freeze for 5 minutes) to firm dough shell. Using a table fork, prick bottom and sides — including where they meet — at 1/2-inch intervals. Flatten a 12-inch square of aluminum foil inside shell, pressing it flush against corners, sides, and over rim. Prick foil bottom in about a dozen places with a fork. Chill shell for at least 30 minutes (preferably an hour or more), to allow dough to relax. 2. Adjust an oven rack to lowest position, and heat oven to 400 degrees. (Start preparing filling when you put shell into oven.) Bake 15 minutes, pressing down on foil with mitt-protected hands to flatten any puffs. Remove foil and bake shell for 8 to 10 minutes longer, or until interior just begins to color. 3. For filling, blend the first 7 ingredients in a 3-quart heavy-bottomed saucepan; bring the mixture to a sputtering simmer over medium-high heat. Cook pumpkin, stirring constantly, until thick and shiny, about 5 minutes. As soon as pie shell comes out of oven, whisk heavy cream and milk into pumpkin and bring to a bare simmer. Process eggs in food processor until whites and yolks are mixed, about 5 seconds. With motor running, slowly pour about half of hot pumpkin mixture through feed tube. Stop machine and scrape in remaining pumpkin. Process 30 seconds longer. 4. Immediately pour warm filling into hot pie shell. (Ladle any excess filling into pie after it has baked for 5 minutes or so — by this time filling will have settled.) Bake until filling is puffed, dry-looking, and lightly cracked around edges, and center wiggles like gelatin when pie is gently shaken, about 25 minutes. Cool on a wire rack for at least 1 hour. Beat cream at medium speed to soft peaks; gradually add confectioners’ sugar then brandy. Beat to stiff peaks. Accompany each wedge of pie with a dollop of whipped cream. Um, I can’t believe you put booze in a pie crust. I’m intrigued, missy. Any thoughts on vodka crust v. rum or brandy? This pumpkin pie proved itself. Crust was great, the filling something to reckon with. Rose Levy Beranbaum says this crust holds its shape better than any other pie dough. If desired spray the inside of each bag with nonstick cooking oil spray to keep the dough from sticking. Working with one bag at a time and leaving it unsealed knead the mixture through the bag by pressing with the heel of your hand to help the dough come together.